As an avid consumer of all things classic and classical, I consider myself very lucky to have a home life split between Winchester – site of Jane Austen’s last home and the magnificent Round Table – and Chichester – home of the famous Festival Theatre and the Sussex Folklore Centre. Mid-May saw the Centre’s latest symposium, titled Wonderlands, celebrating all things fantastical, fairy tale and the 150th anniversary of Lewis Carrol’s Alice in Wonderland. 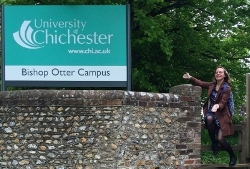 My MA Writing for Children dissertation is firmly built on the foundation of fairy tales, so I happily jetted off to the University of Chichester with my good friend and fellow fairy tale fan, Amy Brown. 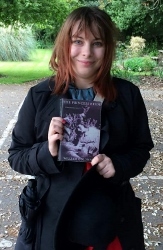 Amy: I have a long-standing interest in fairy tales, and recently completed part of a retelling of ‘Little Briar-Rose’ for my undergraduate dissertation. I also run a folklore and fairy tales blog, and love networking with others that share my interest. The Wonderlands Symposium seemed like a fantastic opportunity to meet new people, get some inspiration for my blog and learn a few things. We did not attend every panel between us but we can give you a fair overview of the day. First of all, I must comment on the organisation of the day. The voluntary staff were very helpful, and as well as offering some delicious pastries there was a book-swap stall where I finally got my hands on a copy of The Princess Bride. Bringing and swapping relevant books is a fantastic idea and I wish more conferences could have a stall like this. The first event of the day was a talk by Professor Diane Purkiss on Stuart-era witch-hunts. This made me think about the way folktales evolve depending on the teller, and about the links between religion and fairy tale. Purkiss spoke a lot about the figure of the Elfin or Winter Queen present in many Celtic tales. I enquired as to a possible connection between this figure and characters such as the Arthurian Morgan le Fay or the wicked Queens and Stepmothers of Snow White and Cinderella and Purkiss agreed that there were similarities. It really got me thinking about the history of the lore from which I draw many of my characters. Amy: In particular, I enjoyed Diane Purkiss’s talk. Witchcraft is another area of great interest to me, and I loved learning about Andro Man and the legend of Osian. By far the most interesting panel for me was the talk on Re-Imagining the Fantastic. Though speaking in the context of picture books, Mara Alperin’s paper on fairy tale heroines raised some important points. As a fan of adaptations who was disappointed by the recent Alice in Wonderland, Maleficent and Cinderella, I enjoyed a discussion of those three films. It entertained me how often the former film was mentioned, always with an air of sadness rather than anger; a feeling that Burton had thrown away source material perfect for his dark and surreal style in favour of following the Hero’s Journey to the letter, but then again, that’s Hollywood. Amy: Re-Imagining the Fantastic was very informative and offered unique ways of looking at fairy tales and how to adapt them for different purposes. Fairy tales aside, Panel 4: Crossing the Border offered a lot of insight into performance, storytelling and how folklore can affect a landscape. Elizabeth Bennett, Stephe Harrop and Kevan Manwaring delivered some very engaging papers. Bennett’s explored how places can be used as areas for performance, an idea that I love. Each location makes the performance of a story unique, and can bring the folklore alive. Harrop went a step further and actually performed a story as well as presenting her paper. This was a brilliant way to combine storytelling and academia, and her notion of borderlands as liminal places were stories from different countries become entwined was fascinating. Finally, Manwaring talked about the author Graham Joyce and how his works have impacted others. Whilst I had never heard of Graham Joyce, I enjoyed learning about him and gained some new potential reading material! Altogether, the day was very informative, and I’ve been delving deeper into the history of fairy tales over the past few weeks. I encourage you to check out the Sussex Folktale Centre website and Amy’s blog on writing and fairy tales, which are linked below. 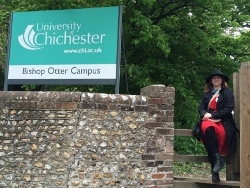 This entry was posted in Guest Bloggers, MA Students and tagged Alice in Wonderland, Amy Brown, Chichester, Claire R Kerry, Diane Purkiss, Fairy Tales, Folklore, Sussex Folklore Centre, Wonderlands Symposium by Litmus 2015. Bookmark the permalink.